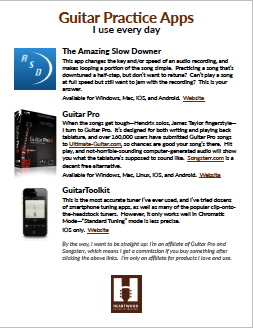 Free report: 3 guitar practice apps I use to learn songs super fast (including the world’s best smartphone tuner). Enter your email to download the free report. I'm so excited to share these apps with you. I use them every day, and they make learning songs MUCH faster. If you don't find what you want above, browse my whole list of chord charts here. My Totally Awesome Guitar Teaching Handbook will show you how to fill your roster, charge premium prices, and inspire your students.